I had an interesting chat with a guy who has been a volunteer on the Paddle Steamer Oscar W for 30 odd years. They have restored the rotting hulk to working order and now run cruises on Lake Alexandrina from Goolwa. 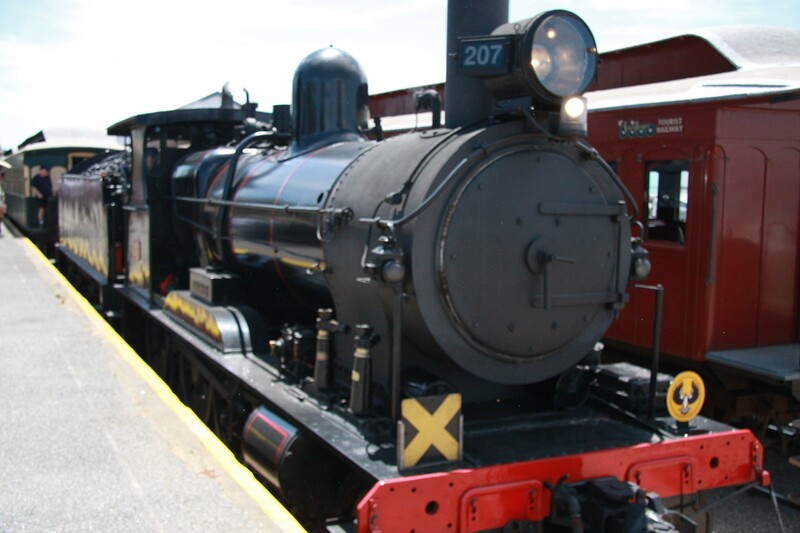 The Oscar W also attend festivals and shows on the Murray and this weekend are at Mannum for a steam festival. 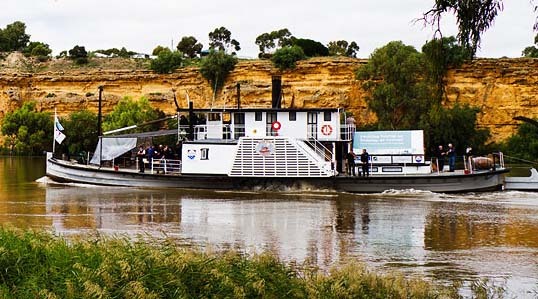 The boat was built in Echuca and worked the Murray for many years. We have dined at the Oscar W restaurant in the old port at Echuca, and I had wondered who was Oscar W, but it wasn’t a who it was an it. The steamer has a steel plate upper body and 3″ thick by 8″ wide red gum planks below water. Using steel is an advantage as it keeps the red gum bottom constantly under the water, compared to all wood boats that when empty float higher and the planks can dry out, they shrink and the caulking falls out. When the boat is filled it then sinks! At Yanga National Park I read that the homestead had been built in part using ballast from bricks used as ballast on paddle steamers, and I wondered why they would need ballast sailing on calm inland waters. Clearly it was to keep all the red gum planks wet and the joints closed. So a puzzle for me has been solved! The Oscar W burns 1 tonne of firewood an hour and has a top speed of 18 Km/hr. Apart from volunteers working on maintaining and sailing the boat they have another group of volunteers who go out onto farms and forests and gather and split firewood. One time recently when the Oscar W was heading up the Murray, the current was so strong they had to have a speed boat pull the front of the boat around when they turned so that they didn’t float sideways down the river out of control. 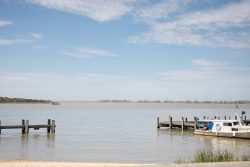 Another time when they and another steamer were returning from a festival at Meningie across Lake Alexandrina, the head wind was so strong they could only achieve one Km/hr at full power. The other paddle steamer lost all headway against the wind and was blown aground and stayed there for a few weeks. Unfortunately, no more cruises are scheduled until December so I won’t be able to enjoy a cruise on the Oscar W.
On Sunday I went to the Goolwa market before going on the Cockle Train for a return trip to Victor Harbour. 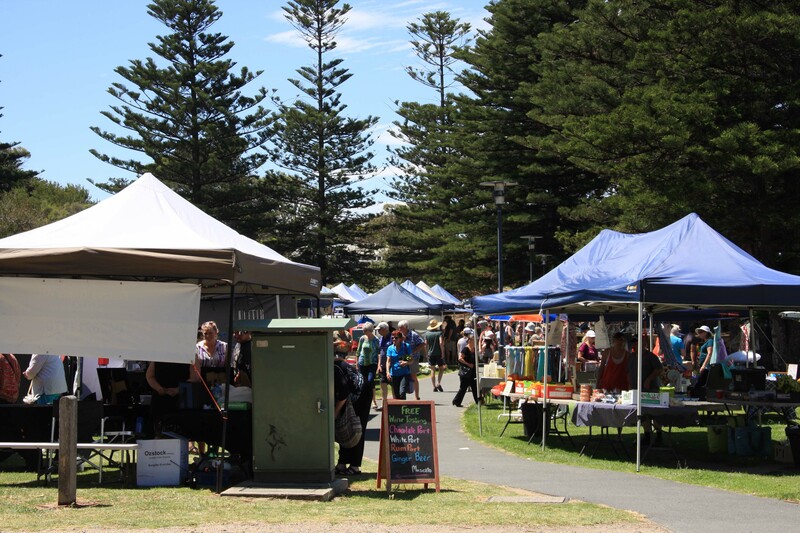 The market was crowded as you would expect with a good range of things for sale. It is located on the wharf as is the train station so it was all very convenient. The railway opened in 1854 and was the first line in SA and the first in Australia using iron rails. 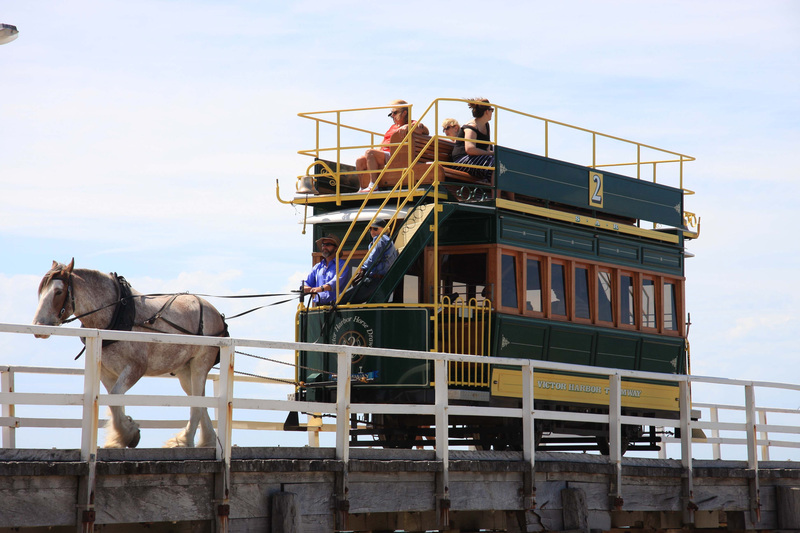 Until 1884 trains were pulled by horses that were changed at stations as required, it would have been a slow trip. The train is called the Cockle Train because it used to bring fishermen to Goolwa on the way to catch cockles on the ocean beach. The cockles were very prolific and large at Goolwa. There are bag limits for amateur fishermen (300 per day and min. 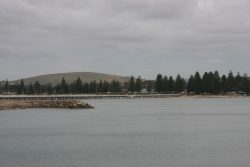 3.5 cm across) and a closed season from June to October, but at the moment the beach is closed to cockle gathering due to contamination by E-coli probably from Murray floodwaters. The steam train arrived and they had to add a couple of carriages which was interesting to watch. There was plenty of room on the train and good views over Lake Alexandrina and the ocean along the way to Victor Harbour. There was a commentary from time to time but I think they must have borrowed the PA and announcer from Richmond Station, so it was unintelligible. 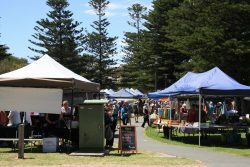 There was a sea breeze at Victor Harbour so it was quite pleasant sitting in a park by the beach eating lunch (home made ham and tomato roll for you gourmands) waiting for the return trip. 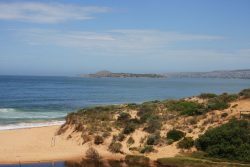 I didn’t feel like walking around, but I may return to Victor Harbour for another visit. I have always said you need to take a good tool kit when camping and now I know why. I have a pair of stilsons in my tool box (like very large multigrips) and I have never used them while camping. But tonight I felt like pickled onions and cheese for tea and when you feel like pickled onions, you have to have them. Couldn’t get the lid off, I tried everything to no avail, then I remembered the stilsons, immediate success; and they were just as good as I imagined, the pickled onions that is. So remember when you go camping take a good tool kit, or go without pickled onions. 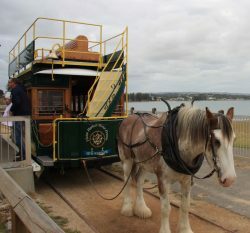 There is a horse tram in Victor Harbour on a pier in Encounter Bay. 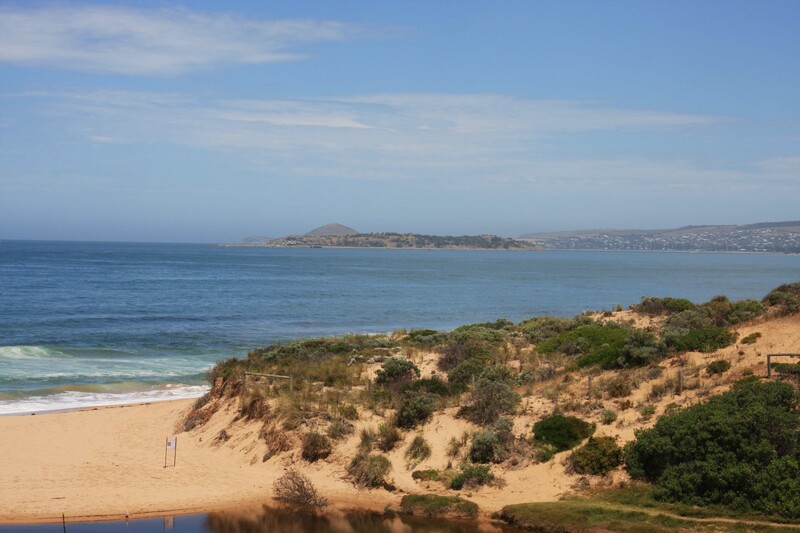 It is named Encounter Bay because Mathew Flinders met Captain Baudin, a french explorer, in the bay on April 8th (our wedding date) in 1802. Mathew Flinders was mapping the complete coastline of Australia at the time. The ride on the tram was interesting and relaxing, the tram travels at a walking pace. 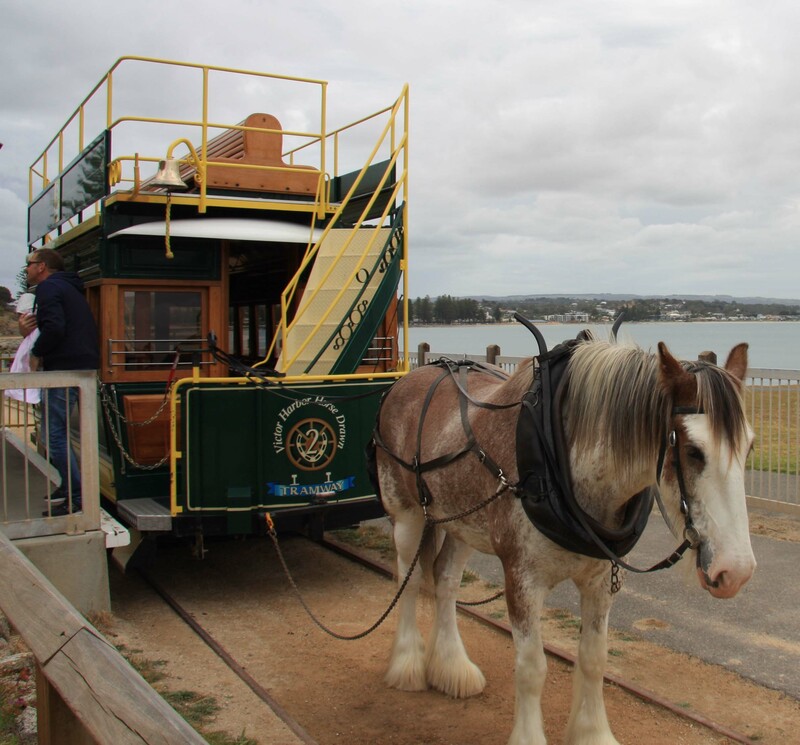 The tramway used to take freight to ships anchored off Granite Island and closed in the 1950s. New trams were built and the rails replaced and the passenger service opened in 1986 to celebrate South Australia’s 150 year anniversary. 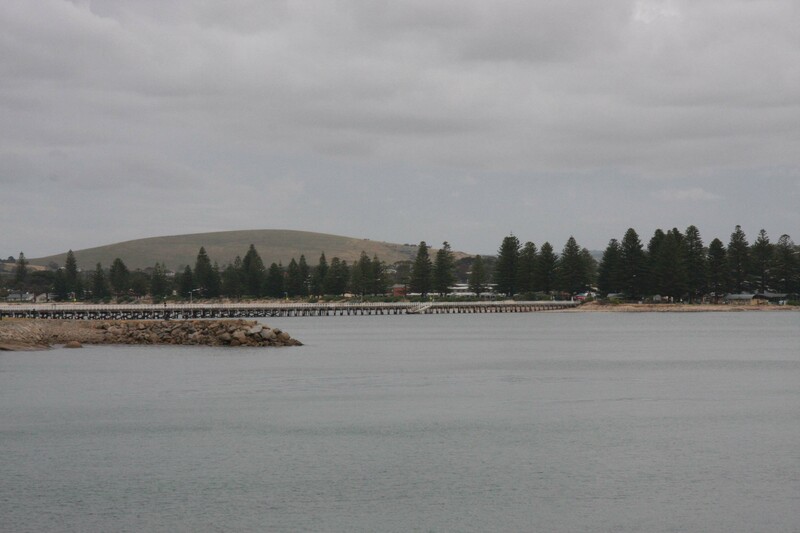 The pier is over 600 metres long and it takes the tram about 10 minutes to cross the pier. 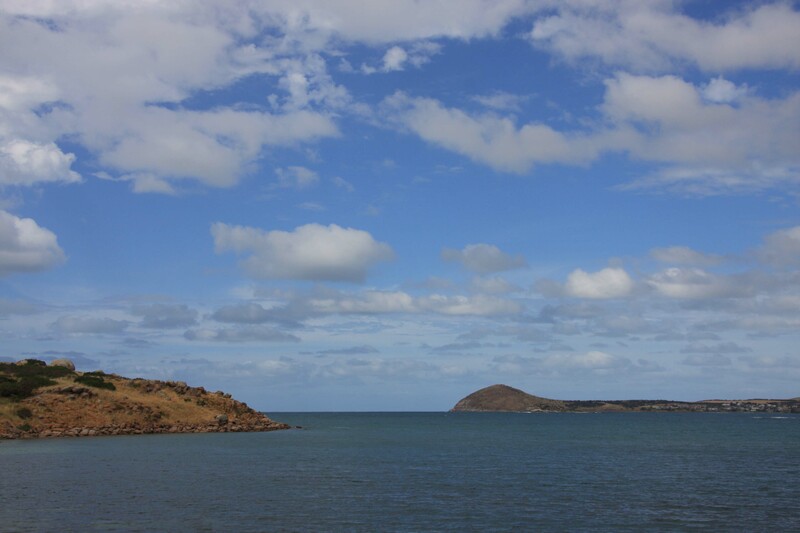 The tram then winds around the edge of Granite Island for another 300 metres to where the port used to be located. 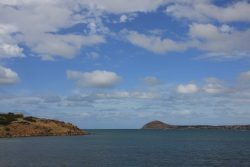 After the tram trip I went to Newlands Head Conservation Park for a BBQ lunch. 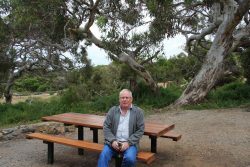 Marg and I had visited here for a picnic a few years ago so it bought back good memories. 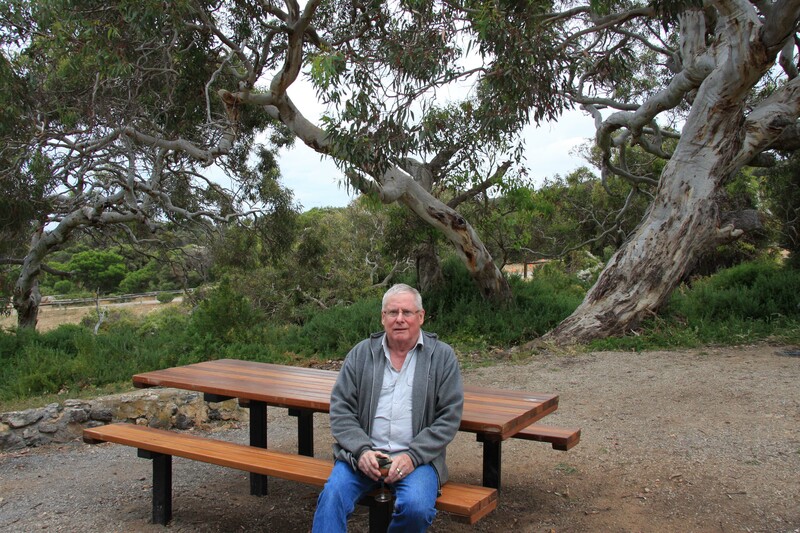 As you can see in the background the gum trees are wonderful old twisted veterans, much like me! Tomorrow is my last day at Goolwa and I go on a cruise on Lake Alexandrina and the Coorong. The cruise includes morning and afternoon tea and lunch, so that will be good. So enjoyable to read Dad. You’re an inspiration. Thanks Cam, it is very sad, but do I have lots of wonderful memories. Mum told me many times that I would have to get on with my life, she thought she would be the first to die. Sounds like a very nostalgic trip Russ. I am glad you are able to re-live some good memories with Marg. Love your detail mindedness when recording your adventures. Enjoy your cruise.